What's luxurious, affordable and so on trend? This gift guide, of course! I think we can all agree - sometimes, you just need a little treat! 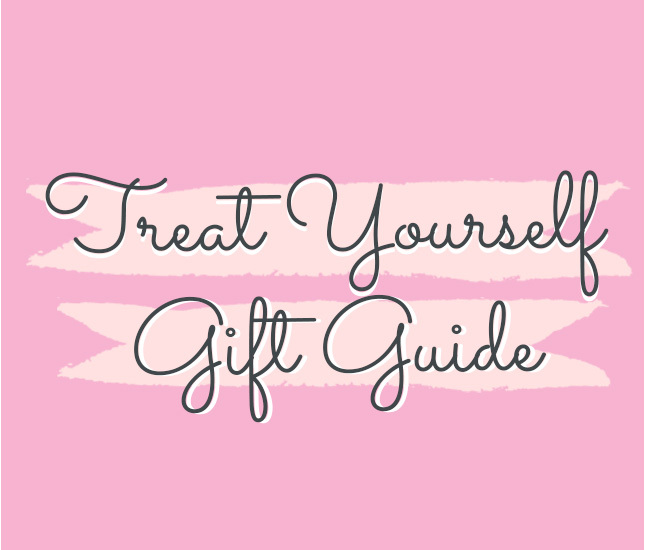 Whether you're a #girlboss, a full-time college student or just looking for a little treat for yourself, we've got you covered! 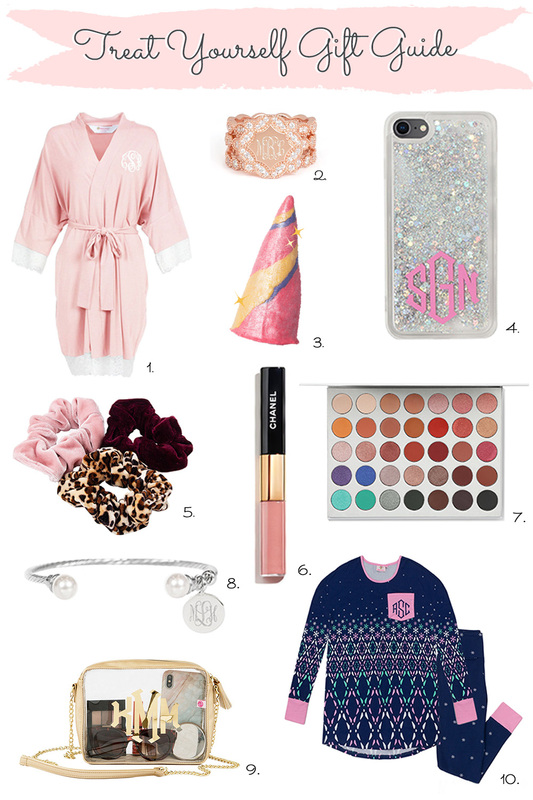 In this gift guide, we've included a few of our monogrammed favorites from Marleylilly as well as trendy goodies you'll love oh-so-much! So sit back, relax and treat yourself, girl! Every gal needs a soft, buttery bathrobe in their possession! Whether you're getting ready for work, class or your weekend GNO, relax in your Monogrammed Bath Robe! This style is classic and luxurious without breaking your bank - what's not to love?! Go ahead and add it to your cart - you need this ring stack! This vintage-inspired set has a beautiful quatrefoil mirrored rose gold monogrammed disc coupled with two pave ring bands. Wear them with the centerpiece or wear the ring bands alone! What's more luxurious than a bath bomb (and a cute one, at that)! Hey, it's all the details! Relax after a long day on the grind with this LUSH bath bomb! We all know LUSH is famous for their bath bombs, so you know it won't disappoint. Is it safe to say we all love glitter? This new Marleylilly Phone Case has been a favorite since its launch and it's easy to see why! Choose from a variety of vinyl monogram options to create your dream phone case! With Valentine's Day around the corner, order a red or pink vinyl monogram for a festive finish! Glitter isn't your style? Check out more monogrammed options from pineapples to plaid to marble! ICYMI - the 90s called and scrunchies are back! This fashion trend has blown up recently and personally, I'm not complaining! This adorable trio comes in a set of three velvet scrunchies - single mauve, burgundy and leopard print. Wear them on your wrist or style them in your best fun bun for an effortless hairstyle! In the spirit of "treat yourself" - go big and go designer! If you're looking for a beauty product to splurge on, look no further! We've seen bloggers like Lonestar Southern rave about this product, and it's easy to see why - it's a gorgeous finish, it's long-lasting and it smells like heaven! The best part is the color is so versatile. Wear it to the office or throw it in your Monogrammed Clutch for your next black tie work affair! Speaking of cosmetics, if you're looking for a huge bang for your buck, you must try the Jaclyn Hill palette. For such a great price, you can grab a variety of 35 pans of gorgeous pigment. Whether you prefer natural eye look or a bold pop of color, this palette is so workable for everyone from makeup beginners to pro artists! Grab one of these Monogrammed Bags for all your go-to glosses! This pearl bangle is so delicate and classic. Bring your LBD to life or wear it with your sorority t-shirt! Whatever works for you, this bracelet will work right with you! Be ready for any spontaneous sporting event or summer concert with this grab-and-go crossbody! This is a great product to have in your purse collection! This purse sold out SO fast the first time, so we had to bring in a new color. If silver is more your style, check out the iridescent silver color, too! Looking for another style? Don't miss all these alternative clear bag options! Finally, to wind down at the end of the day, hop into this adorable pajama set! Be cute and cozy with this matching top and bottom! If you're as obsessed with these as we are, grab your bestie a pair for a selfie must-have! What are you favorites from above? Let us know in the comments below!